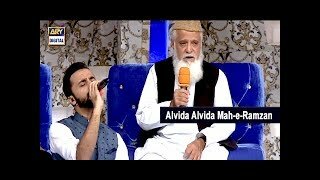 Ramzan, a month of religious steadfastness, worship, forgiveness and blessing is celebrated in its full zeal and fervor with Shan-e-Ramzan every year.Since the last three years Shan-e-Ramzan has been living on its tradition of being the best Ramzan transmission with Junaid Jamshed and Waseem Badami as its hosts. This year, sadly, with Junaid Jamshed not being amongst us, Waseem Badami will be seen hosting the show alone. He was seen remembering Junaid Jamshed on this occasion:This year Ramzan will be seen being celebrated on a much grander scale through Shan-e-Sehr and Shan-e-Iftaar everyday live on ARY Digital at 1:30 am and 2:30 pm respectively. The shows are religiously and culturally enriched uplifting the essence of Ramazan.The Shan-Ramazan transmission starting off with the recitation and translation of the Holy Quran in the soulful voice of Qari Waheed Zafar Qasmi will feature religious scholars as guests followed by a question/answer session to discuss various Islamic issues. This will be followed by a daily interactive segment in Sehr & Iftar in which audience will be answering the questions to win exciting prizes. Students from different universities and colleges will participate in an Islamic quiz to win a bumper prize.Notable scholar Mufti Sohail Raza Amjadi, will do a daily segment in Shan-e-Seher where he will suggest different virtuous supplications to audience.A segment in Shan-e-Sehr will also provide viewers to be part of Shan-e-Ramazan Transmission from their home by special LIVE Skype session. Wasim Badami along with notable scholars will have live Sehri with audience while discussing different Islamic queries.Moreover, this year, Shan-e-Ramazan will reach out to people like none other. Every day Shan-e-Iftar will feature a segment where Iqrar -ul -Hassan & Shahid Afridi will help deserving souls who have no one to look up to and are in dire need.